When beautiful but aloof Claire Harkness is found dead in her dorm room one spring morning, prestigious Armitage Academy is shaken to its core. Everyone connected to school, and to Claire, finds their lives upended, from the local police detective who has a personal history with the academy, to the various faculty and staff whose lives are immersed in the daily rituals associated with it. Everyone wants to know how Claire died, at whose hands, and more importantly, where the baby that she recently gave birth to is a baby that almost no one, except her small innermost circle, knew she was carrying. At the center of the investigation is Madeline Christopher, an intern in the English department who is forced to examine the nature of the relationship between the school's students and the adults meant to guide them. As the case unravels, the dark intricacies of adolescent privilege at a powerful institution are exposed, and both teachers and students emerge as suspects as the novel rushes to its thrilling conclusion. 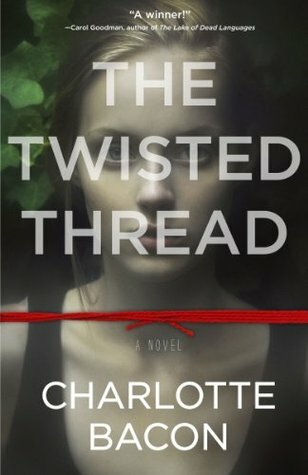 With The Twisted Thread, Charlotte Bacon has crafted a gripping and suspenseful story in the tradition of Donna Tartt's The Secret History, one that pulls back the curtain on the lives of the young and privileged. Charlotte Bacon graduated from Harvard University and received a Master of Fine Arts degree from Columbia University. Her published books include A Private State, Lost Geography, There Is Room for You and Split Estate. Her debut collection of stories, A Private State, won the PEN/Hemingway Award for First Fiction in 1997. This book was okay. I think that there were some parts of the plot that fell flat and some were irrelevant. Also some of the characters were a little under developed because of the POV changes which made this book a little harder to read.